SOLD! Entertainment Center – Real Cheap ($10!) or Free with $50 in Any Other Purchases! 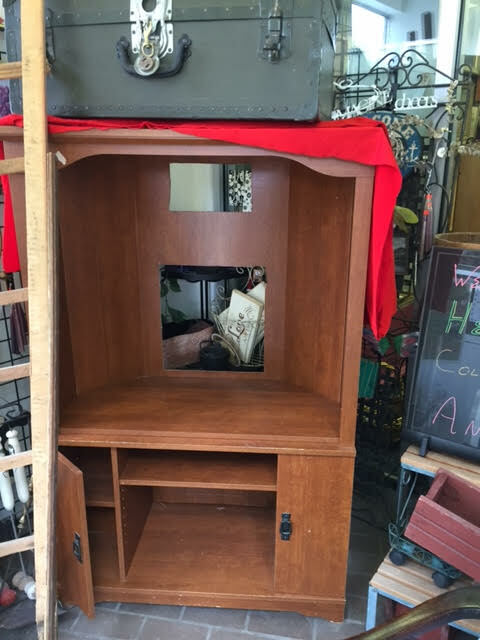 Entertainment Center – $10, or free with any $50 purchase! Once again we’ve found ourselves in the possession of a piece of furniture that we’d like to get rid of FAST! 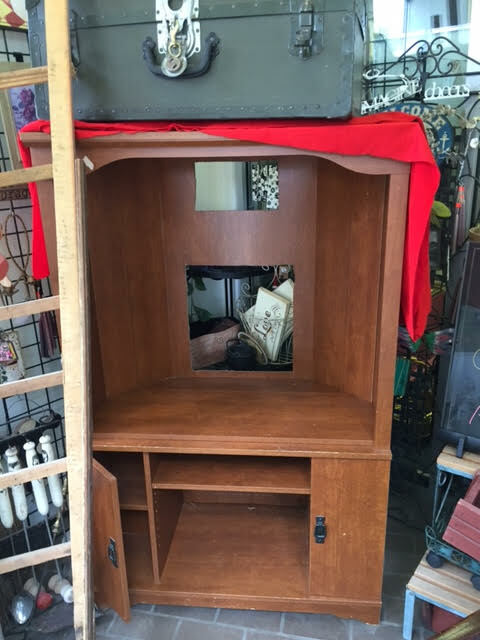 This is a nice little entertainment center that I was able to get into our Jeep all by myself (meaning it’s not that huge or heavy), but it’s not the kind of thing that people are usually looking for when they come to our shop. So, come on in and take it away for $10.00…. or buy $50.00 worth of anything else in the shop and get it for free! The red material on top is to prevent the old trunk from scratching it up. Condition: It’s made of that particle board stuff – not real wood – so it does have some minor damage, although it’s really not bad at all. Dimensions: It’s about 4 feet high by 3 feet wide. Price: $10.00 plus 5.5% State of Maine Sales Tax. You’d pay a lot more than that and might even have to put it together yourself if you were to buy a new one. Don’t forget to sign up for our blog at http://heritagecollectiblesmaine.com so you can get all the most recent information and updates. If you love books the way we love books (or even if you just like books, check out Heritage Books, Maps & Ephemera at 5 Park Street in Lewiston, or follow our blog at http://heritagebooksandmaps.com! This entry was posted in Furniture - Miscellaneous, Furniture - Primitive & Farmhouse, Home Decor, Primitive & Farmhouse Decor and tagged cheap entertainment center, entertainment center, Heritage Collectibles, inexpensive entertainment center, television stand. Bookmark the permalink.